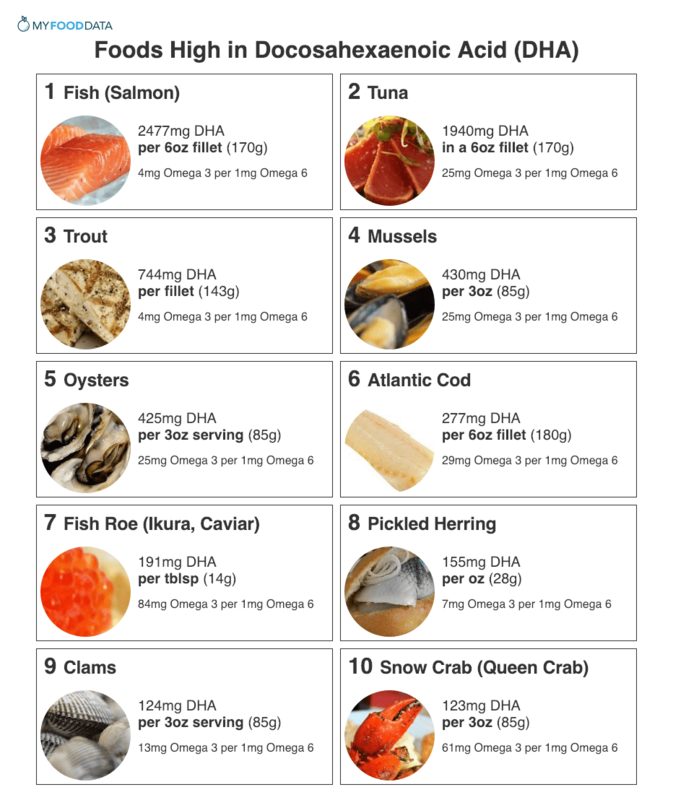 DHA is found primarily in fish and seafood. (4) It can also be created by the body using alpha-linolenic acids (ALAs). (5) Since DHA is important for cognitive development, it is also found in breast milk. (6) This is true even if the mother does not consume fish or any animal products, as DHA is made from ALAs which are found in plants. Foods high in DHA include salmon, tuna, canned tuna, trout, mussels, oysters, cod, fish eggs, pickled herring, clams, and snow crab. (4) Pregnant women should avoid mackerel, swordfish, and striped bass due to their potential mercury content. All other sources should be considered safe and healthy as long as they are fresh and well prepared. For more foods high in DHA see the list of 200 foods high in DHA fats, and the list of foods high in omega 3 fats. Oysters are also very high in iron. Beneficial effects of docosahexaenoic acid on cognition in age-related cognitive decline. Conversion of alpha-linolenic acid to eicosapentaenoic, docosapentaenoic and docosahexaenoic acids in young women.